The husband and I have had our eye on these four chairs at the thrift store for some time now, but we were waiting for them to be on sale. Is it weird that we wait for the clearance price at the thrift store? That's pretty much the ultimate in frugal, I would say! Our thrift store has four different colors of price stickers, and each week a certain color is 50% off. 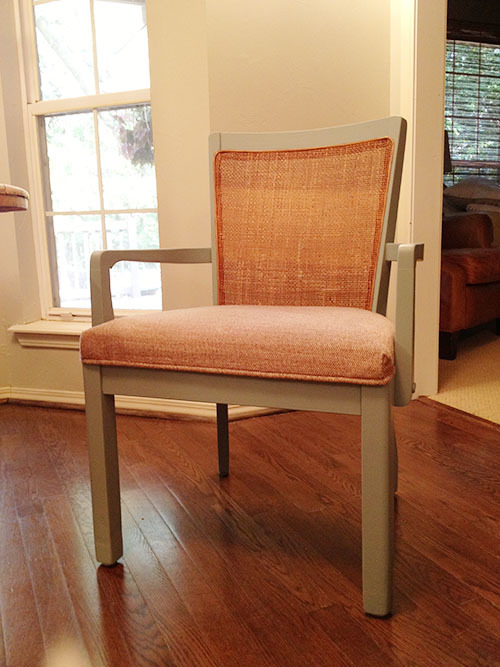 We were waiting for the yellow tags to be on sale so we could snag these nice, solid dining chairs for only $15/each. No wobbly chairs here! I knew we'd want to paint the chairs, but I wasn't sure what color. And I had planned to paint the entire chair (caned back included) until I saw this image on Pinterest. Suddenly I had my inspiration! 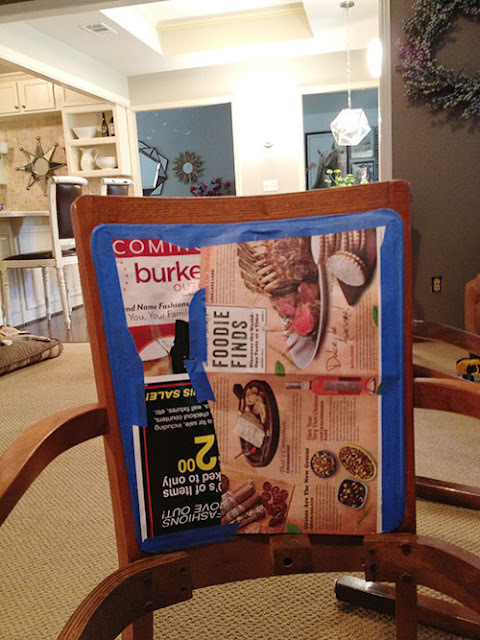 The only problem with leaving the cane part of the chair in its natural state was that we'd have to do some tedious taping to avoid painting it. Bleh! 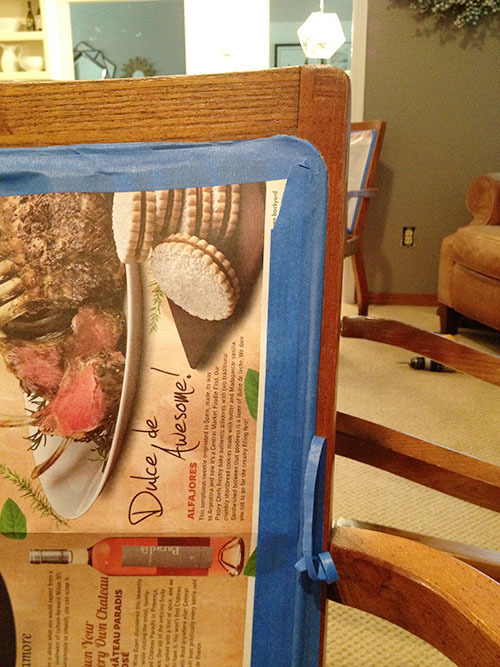 We figured it would be worth it in the end, so we spent about an hour taping the chairs. 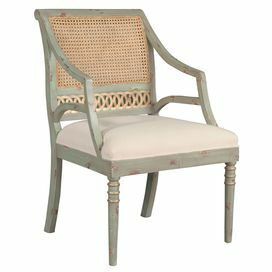 The front edge of the caned back was curved, so that presented some challenges. We developed our own method for this part, which worked really well. We covered the edges in painters' tape, making sure to press down around the border so the tape was fulled adhered with no air bubbles. Then I used a small razor blade knife to cut around the border of the cane back, slowly peeling back the painters tape to create a clean edge. 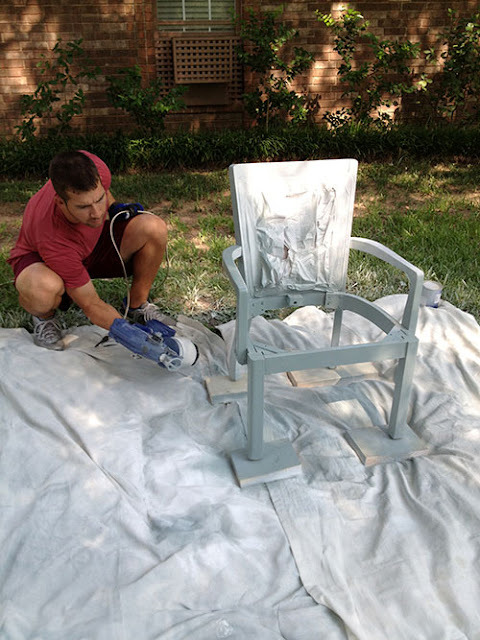 For the next step, we busted out our Graco paint sprayer to apply a coat of Kilz primer. 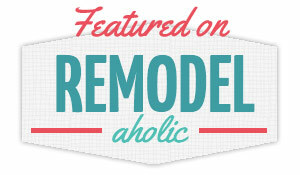 Let's talk about choosing a paint color! Sometimes I know right away what color I want to paint something, but in this case I was open to different options. However, I didn't want to depart from my home's existing color scheme too much because I like each room to flow well into the other. 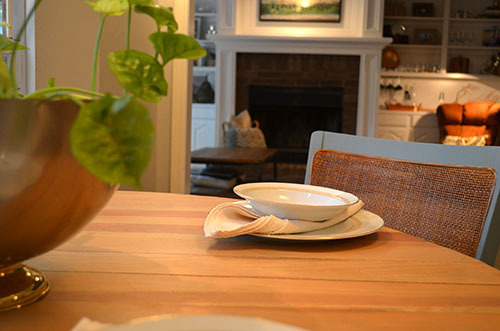 The kitchen is literally the center of the home, so these chairs can be seen from a number of different vantage points. 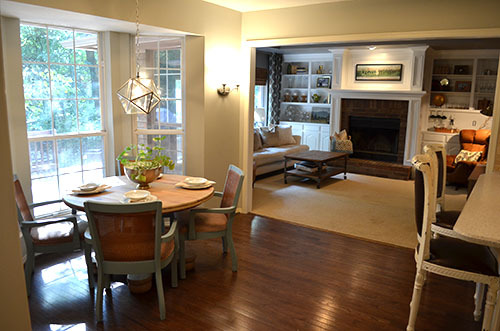 Anything outside of our soft, soothing neutral color scheme would probably stick out like a sore thumb. That being said, I knew I didn't want white or grey because the entire kitchen is white and grey already. A quick scan of some my favorite textiles reveals sort of a signature color I have used in each room– I call it "dusty blue." Since "dusty blue" is a consistent element in our house, I knew it was a safe choice and would bring just the right amount of color we needed. I headed to Lowe's to check out my options. In the end, I decided on Aqua Smoke by Olympia. The Aqua Smoke was loaded into the paint sprayer and the husband went to town on the chairs. We're still in love with our Graco TrueCoat Plus II, by the way. It just makes these projects SO much easier and faster! I highly recommend investing in a paint sprayer if you like to do DIY projects like this. The sprayer saves so much time, and the finish is so much smoother than painting it by hand. It was so gratifying to pull off the tape and paper to see the paint color mixed with the natural cane back. I loved the finished result so much! In case you're wondering, I always planned to keep the existing upholstery. 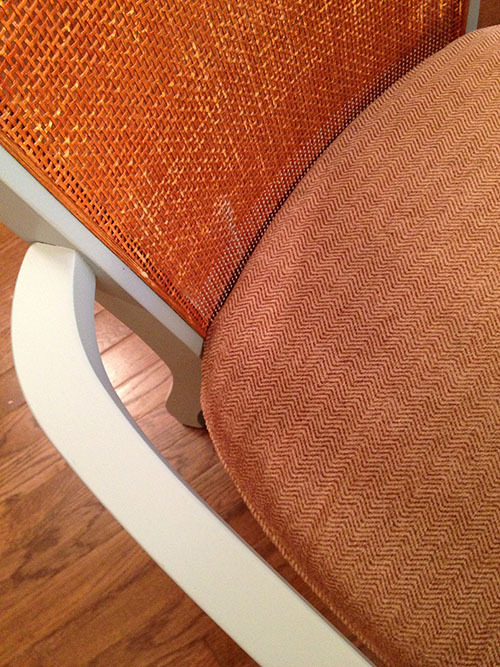 It's a nice neutral herringbone with no stains or blemishes, plus I liked the cording around the edge. I think the cane back coordinates nicely with our flea market table. Between the flea market light and table, and our thrifted chairs, this kitchen nook cost us about $120. If you add about $15 for paint, we're up to $135. 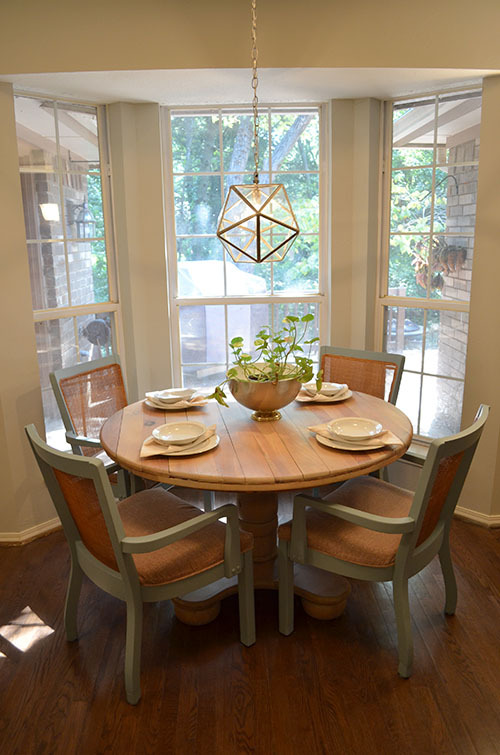 Not too shabby for a table, four chairs and a unique pendant light! 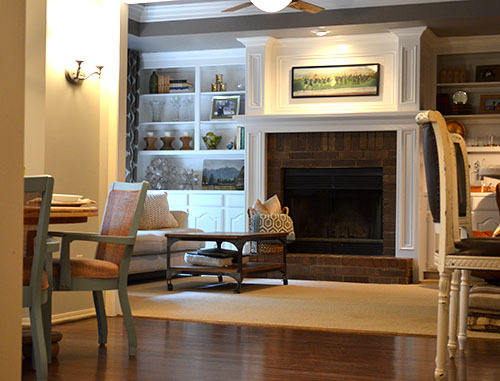 The next couple of images help you see how the Aqua Smoke color flows well with the other rooms. I was worried I wouldn't like the color, but it came out just as I imagined! 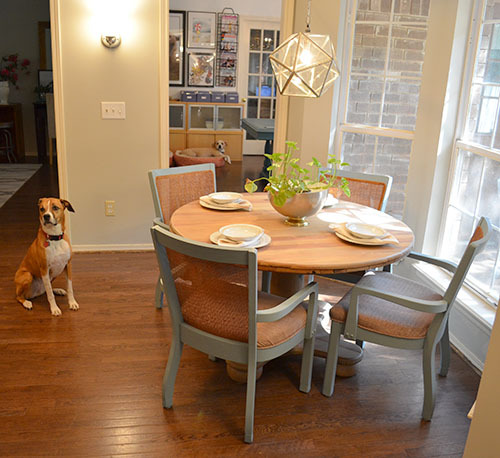 Having four chairs around this table makes the kitchen feel much more complete. 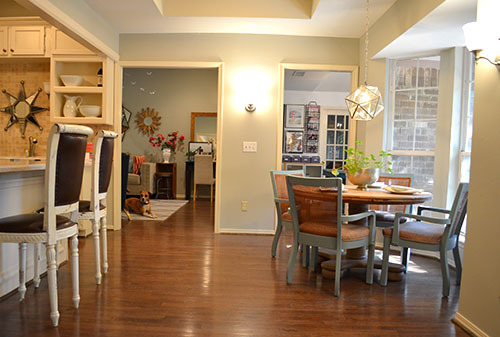 Every little piece of progress makes our home feel more like "us!" Just for fun, here's a picture that includes my two furry assistants! Everyone has a lazy coworker– I have one that is always sleeping on the job!